(Bloomberg) -- President Donald Trump has ordered the withdrawal of the approximately 2,000 U.S. troops in Syria. The departure of the Americans would leave plenty of other combatants still on the battlefield as the civil war approaches its eighth year. Government forces backed by Russia and Iran are pummeling the few remaining rebel-held areas. Turkey has reinforced troops on its border to battle both Kurdish fighters and remaining jihadists, who are trying to defend the shrinking territory they hold. Here’s a look at who’s still fighting and why. Forces loyal to President Bashar al-Assad, backed by Russia, Iran and the Lebanese militia Hezbollah, have managed to reclaim most of the terrain once held by Syrian rebels. But the battle-hardened troops will get no respite until they’ve taken it all back. Assad has defied international pressure and made no concessions to the rebels, insisting they are all “terrorists.” A decisive victory in the war would put him in a favorable position for a redrafting of the Syrian constitution, which the United Nations is pushing for early this year as part of a political process to end fighting. Under relentless bombing by Russian and regime forces, the rebels, who once aspired to overthrow Assad, have lost ground and now maintain control over areas in the northwestern province of Idlib. Islamist fighters linked to al-Qaeda, once regarded as among the most effective rebels, are no longer the force they once were. Still, this year Hayat Tahrir al-Sham, a coalition led by a group once known as the Nusra Front, became the dominant force in Idlib in a sudden advance that threatened to unleash new instability. The group is fighting to create an Islamic emirate and enforces Islamic law where it controls territory. Its secular counterparts among the rebel forces are struggling to stand their ground in the hope of securing a meaningful role in future peace talks. The likelihood of that happening diminishes as the regime continues to advance militarily. The jihadists of Islamic State, who aim to create a puritanical Islamic society, have lost nearly all the terrain they once controlled. They’ve been pushed to an ever-smaller area along the Iraq-Syria border by U.S.-assisted Kurdish forces and Russia-backed Syrian troops. Given that Islamic State considers it anathema to negotiate with the regime, which it regards as heretical, the battle looks fated to continue until the group has lost all its territory. Hundreds of Islamic State fighters have been captured and face an uncertain future in the hands of Kurdish forces. For those who escape the battlefield, the game plan calls for melting into the population to wage an insurgency or relocating to another staging ground for jihad. Turkey has played a complex role in the war. A U.S. ally and supporter of the Syrian rebels, recently it’s worked with regime backers Russia and Iran to formulate joint approaches to the conflict. Turkey is part of the U.S.-led coalition against the Islamic State, but it’s repeatedly attacked the bloc’s most effective ground force, the U.S.-armed Syrian Kurdish fighters of the People’s Protection Units, or YPG. Turkey considers the YPG an enemy because it has roots in the Kurdistan Worker’s Party, or PKK, which has battled for an autonomous region inside Turkey on and off since 1984. After Trump’s withdrawal announcement, Turkey reinforced its troops along its border with northwestern Syria. It said it was prepared to clear out remnants of Islamic State. But it also had its eye on the YPG, which, with the U.S. gone, would be bereft of an important protector. The YPG seeks autonomy for Syria’s Kurds and has shown a willingness to work with any power capable of advancing that goal. It’s been a force in the battle against Islamic State but not directly against the Assad regime, which has supported the related PKK. The YPG’s successes against the jihadists, and a unilateral withdrawal of regime forces from several Kurdish-majority areas, enabled it to establish control over about a third of Syria, in the northeast. Now, the regime wants it back, not least of all because of the many oil fields there. That, plus Turkey’s mobilization and the announced U.S. pullout threaten the YPG’s position. Restarting suspended negotiations with the regime over autonomy arrangements for Kurdish-majority areas could offer the group a way to advance its cause, although it has lost leverage. Having achieved its main objective of ensuring the survival of the Assad regime, its main ally in the Middle East, Iran’s interests now are in locking down postwar benefits. Iran, which deployed its elite Islamic Revolutionary Guard Corps to Syria, is expected to keep forces there. It is said to want to establish a land corridor stretching from Iran to Lebanon through Iraq and Syria so that it can more easily transport arms and equipment to its client, Hezbollah, the militant Lebanese group that’s played a major role in the Assad regime’s triumphs. On other fronts, Hezbollah serves as a proxy force for Iran. It can attack targets associated with Israel and the U.S., which Iran considers its greatest foes, without provoking the reaction such a move by a state would precipitate. Israel, which regularly clashes with Hezbollah on the Lebanon border and went to war with the group in 2006, wants to prevent Iran from creating that corridor, establishing a permanent foothold in Syria, and providing Hezbollah with precision-guided missiles or the means to build them. Accordingly, since the war in Syria began, Israel has frequently attacked targets there -- “thousands” of them, outgoing military chief Gadi Eisenkot told the New York Times in mid-January -- including Iranian ones. Having turned the war in favor of the Assad regime with its bombing campaign starting in 2015, Russia is the premier power in Syria, and Trump’s decision to remove U.S. troops strengthened its position. Russian officials say they doubt Islamic State has been decisively defeated, and they still want to see the country made whole. Toward the latter goal, Russia faces the complicated task of mediating among the regime, the Kurds and Turkey. President Vladimir Putin’s Middle East envoy said in an interview in December that once Assad regains full control of Syria, Iranian-backed forces should leave. Iran is likely to have a different view, possibly setting up a postwar conflict between the patrons of the winning side. 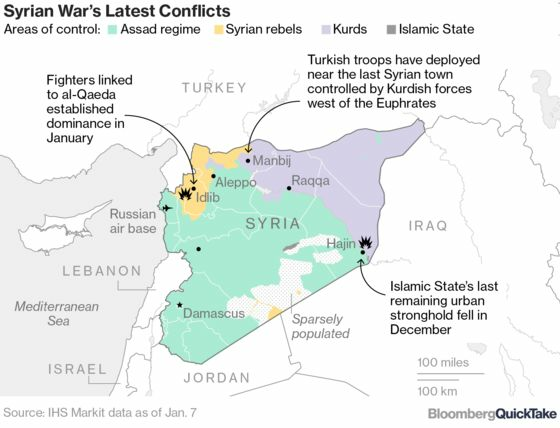 QuickTake explainers on Syria’s civil war, the YPG, the Kurdish people, the fight against Islamic State and Russian leader Vladimir Putin. 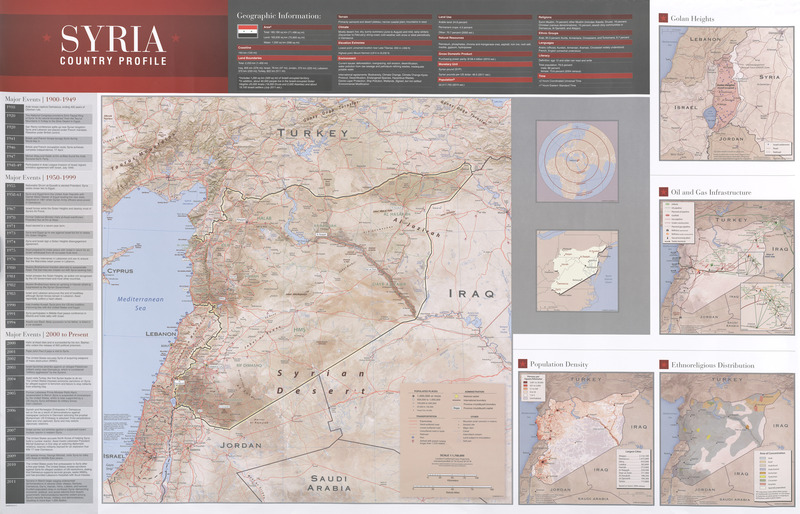 The International Crisis Group explores the conflict over Syria’s northeast. Another ICG report explains the risk of an escalation between Israel and Iran. The Council on Foreign Relations profiles the groups fighting in Syria.